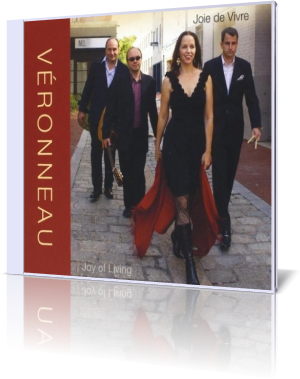 Ambient sound, chamber mood and soothing vocals are the ingredients for Joie de Vivre (Joy of Living) (Véronneau Music, 2011) by Véronneau. Led by French-Canadian vocalist Lynn Véronneau, this small ensemble consists of Ken Avis on guitar, vocals and percussion, David Rosenblatt on guitar and percussion, and Pete Walby on drums. Violinist Dave Kline and tenor saxophonist Jeff Antoniuk appear on selected tracks. Joie de Vivre is an eclectic set of 10 songs that range from French music, to a cover of a Beatles song, a classic by American composers and a taste of Brazil. Charles Trenet’s “La Mer” opens the set. The arrangement is a double homage. The song, translated in English, became a hit for Bobby Darin, “Beyond the Sea.” During the introduction, Véronneau whistles a tune that’s similar to Rogers and Hart’s “Blue Moon.” This delightful piece features the leader singing in French, and a playful violin solo by Kline. Antonio Carlos Jobim’s “Corcovado” is the first of three Brazilian pieces. The musicians capture the bossa nova vibe of this popular song. Véronneau’s voice is rich, like an alto flute. The acoustic guitars and syncopated rim shots by Walby are among the song’s strengths. Véronneau is based in Virginia, USA, where the core members reside. Formed in 2010, they have been nominated for three Wammie Awards (Washington Area Music Association): Best Jazz Group, Best Jazz Vocals and Best Newcomers. The group has performed on the Eastern Seaboard of the United States, as well as festivals in the United Kingdom and Canada.